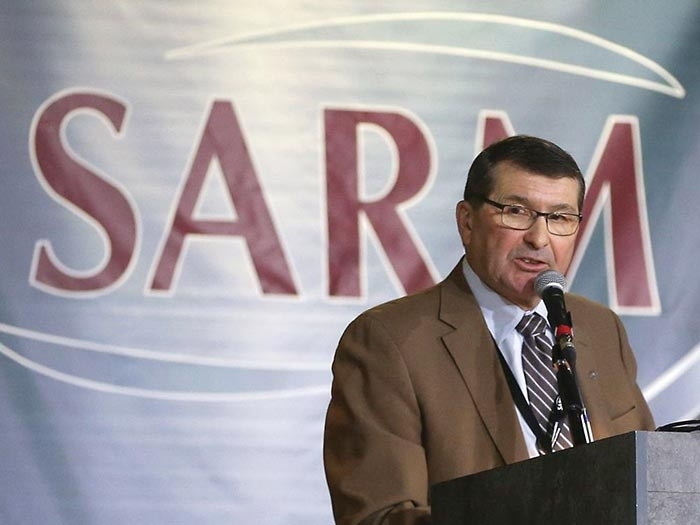 World-Spectator Editor Kevin Weedmark spoke with SARM president Ray Orb last week about the need for pipelines and the town and RM of Moosomin’s efforts on Energy East. The complete interview follows. This issue came up at SARM and the resolution was passed—what discussions have you had since then? Sinc and I have been conversing a little bit more than we usually do—I know he’s working on raising awareness of the importance of Energy East in light of what’s happened with the Kinder Morgan Pipeline, and of course we’re interested in that. I actually had calls from a few business owners in Saskatchewan that they are starting to read about this and asking if there is any way they can help. I’m assuming at some point—if it hasn't happened already—an organization like this Sasktachewan Chamber of Commerce might get involved. I think they are trying to elevate the issue, maybe even onto the national scene. If you noticed, at the Conservative Convention in Halifax they put that on the agenda and they actually adopted supporting Energy East on their national agenda, so we’re pleased to hear about that. We have discussed this with our members of course. It pretty much passed unanimously. Did you folks meet with TransCanada or federal government officials to relay the support of SARM’s members? We didn’t meet directly with the federal government, but we did meet with TransCanada. We’ve had a pretty good working relationship with TransCanada. They usually come to our conventions and they have time set aside for our members to sit down and talk to them to meet them and discuss issues. Usually it’s the RMs that have the pipelines going through that like to meet with them. We have a province that already has a number of pipelines. After it came up at our convention we were at a press conference—I think it was in White City. We publicly supported Energy East at that press conference. I believe it was in Andrew Scheer’s riding so I know he was there, the mayor of White City was there, and I think Jeremy Harrison was there from the province. You saw that TransCanada withdrew their application for Energy East from the National Energy Board. We were talking about it here at FCM. The prairies and the territories brought it up and discussed it. What was the discussion like at FCM? The Provincial and Territorial Associations were really eager to discuss it. When we travel across the country we find that the provinces in the Maritimes are really supportive. They really want Energy East for a couple of reasons. They need to have oil delivered to the Irving refinery, and the other thing is they would like to reduce the amount of rail cars carrying oil, because that to them is more of a safety hazard than anything else, and they’re not happy about that. That number of cars of course is growing because they ship more oil. It just increases. We’ve had discussions with Quebec. We had a meeting in Quebec and the members themselves really want to talk to us about that, and that surprised me a little bit, and I think we probably need to work with TransCanada and to be able to perhaps come and meet with some of these municipalities to talk about how some of the issues that they have can be resolved. Going forward do you see you see a role for SARM and SUMA in trying to continue to bring this forward? Yes, definitely, we will be bringing it forward again. We are going to Ottawa. I’m going to be travelling to Ottawa the first week of October, so we’re going to be meeting with some key cabinet ministers there. I know we are going to meet minister Goodale because of course he is from Saskatchewan and we’re definitely going to have it on the agenda for that meeting. We will be pushing it a little bit harder now than we did after hearing that the application was withdrawn, but we will bring it to the forefront and it probably will be in the media as well. In general how important do you think pipelines are to Saskatchewan? Pipelines are very important to Western Canada and to Saskatchewan. I brought up the fact this morning that Saskatchewan is an exporting province. We produce grain, we produce oil, and we ship a lot of the products out. They need to be delivered to be refined somewhere. We refine some here, fair enough. We can’t consume all that we produce, so getting the oil across the country into either a refinery or a tide water position is a huge economic generator for the country, and it really should be seen as in the national interest to be able to build a pipeline, either to the West Coast or to the East Coast. It creates a lot of jobs. It also improves safety because of the fact it reduces the number of rail cars that are carrying oil. It’s a real economic generator, a good job creator. I think it is a win for the entire country. What advice do you have for the Town of Moosomin and the RM of Moosominin trying to get a groundswell on this issue? I commend them for what they are doing. It’s one thing to bring forward a resolution, but I think another thing which is commendable is to ask our organizations such as SARM and SUMA to take further action on this, so we’re going to do that. We need to develop a good com-munications strategy. I would imagine it will have to be done in conjunction with SUMA. Our SARM midterm convention is coming up in Saskatoon in November. So I have it on the agenda, but I think we really need the rural municipalities in our case to voice their opinion about this. We’ll encourage our members to send their messages of support to supportenergyeast@sasktel.net to show their support. I think we really need every rural municipality in this province to show their support.